Have you ever heard of the ‘Halo Effect’? A biological term, the Halo Effect describes the fertile ecosystems that surround the icebergs in the Southern Antarctic Ocean. 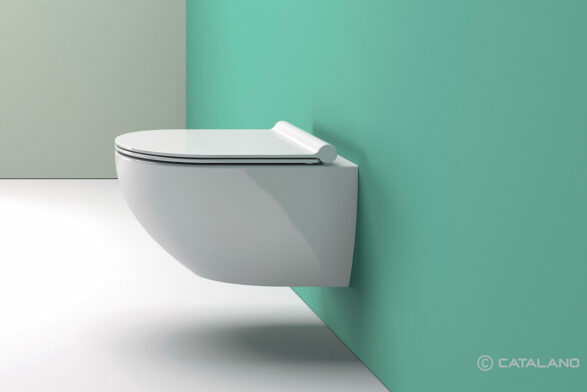 What has this got to do with design you might ask? 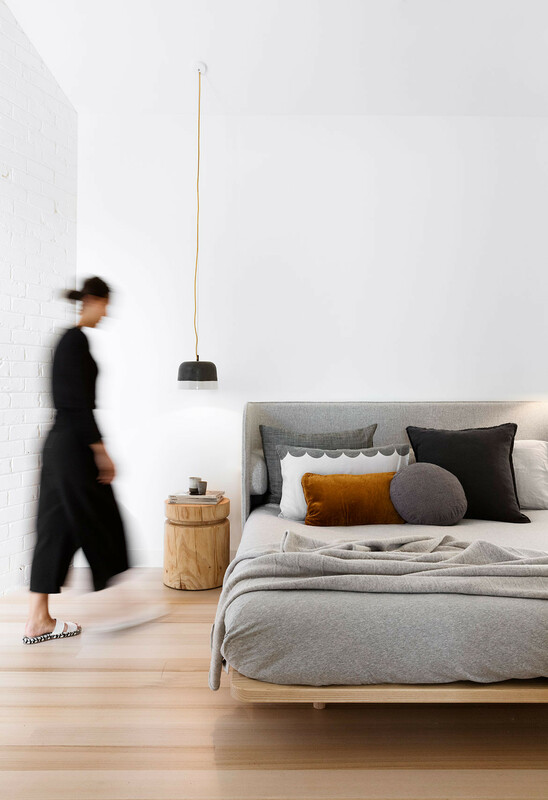 For Melbourne-based design studio Breathe Architecture and their clients – everything. 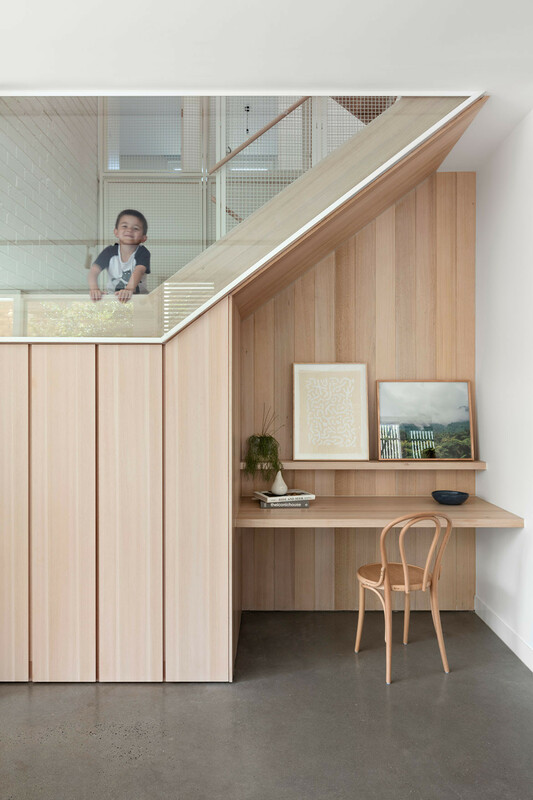 The Halo Effect was the driving concept for the design of this new residence in Melbourne’s Glen Iris, where the primary brief was to better serve the wellbeing of a large family: mum, dad and four school-aged kids. “The Halo Effect is a natural phenomenon whereby melting icebergs act as physical refuge for aquatic organisms while simultaneously releasing nutrients into their surroundings and generating a ‘halo’ of energetic life. 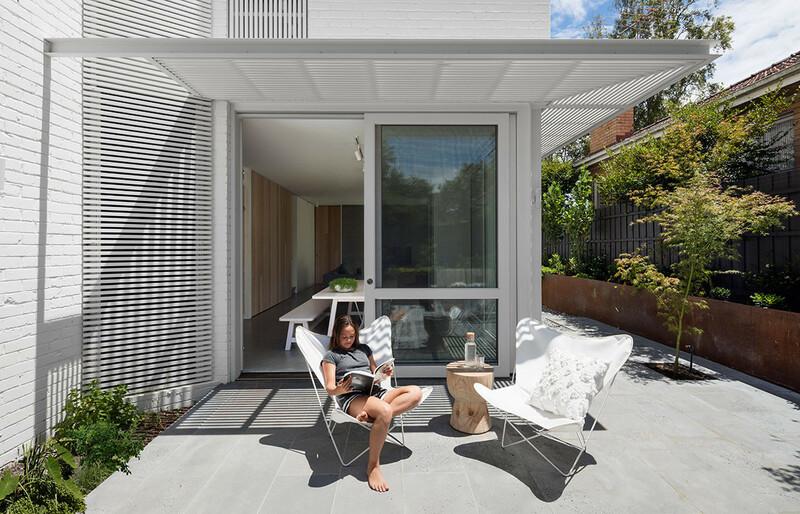 In an analogous way, Halo House acts as a provider for its inhabitants, granting a young family with a sanctum in which to grow and thrive,” says Jeremy McLeod of Breathe Architecture. What tends to happen with some of these crazy and lofty inspirations is that they get the design process going; starting the proverbial fire. However, Halo House has remained very loyal, both aesthetically and conceptually, to the iceberg analogy. 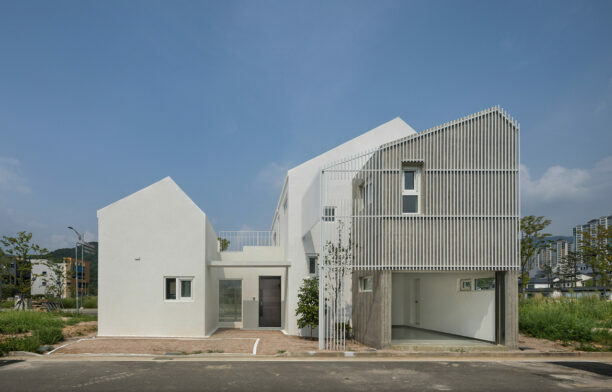 Some of the design responses are based on pure utility, such as the big kitchen with two fridges and two ovens, as well as a first floor laundry with two washing machines (all powered by solar) to help the family run smoothly and efficiently. 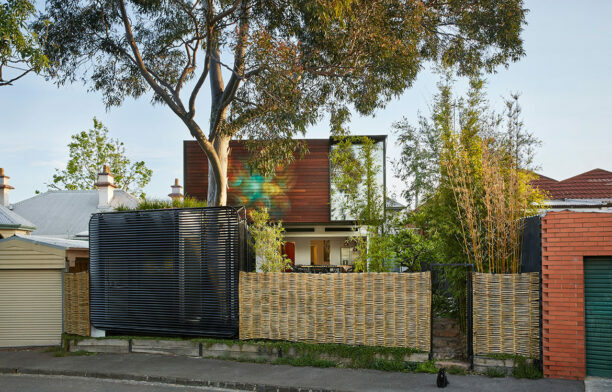 This home is one that provides nourishment and support from the outside in. 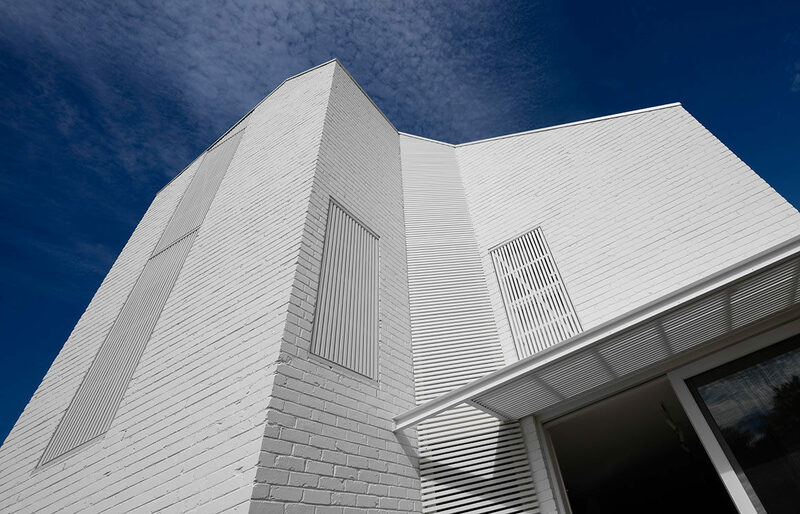 The exterior for example, is constructed from recycled, locally-manufactured bricks. 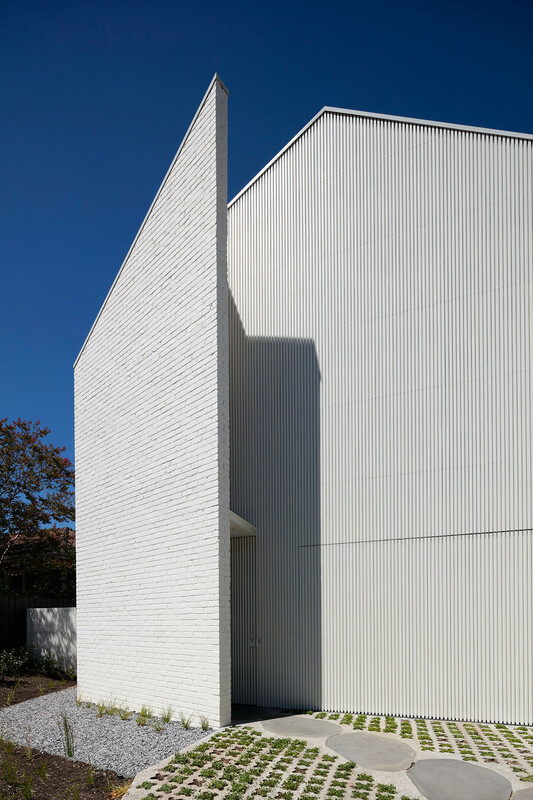 The façade is dramatic but also mysterious, faceless, presenting white-painted brick and pine battens and with no visible openings, giving off that super cool, floating iceberg vibe. The theme continues inside, and though prescribing to an icy-ecosystem, the interior is anything but. 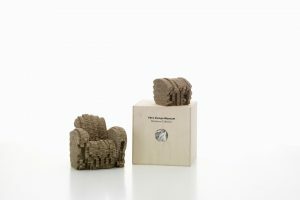 The aim is to make the interior as warm and cosy as possible. 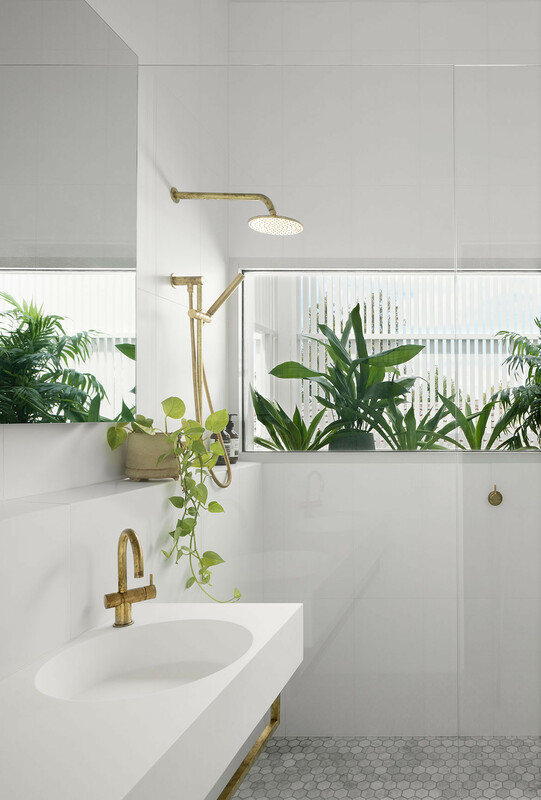 Here, Breathe has cleverly played with white surfaces and pale timber joinery to give the space a light and airy feel while still adhering to the nordic style of the architecture. 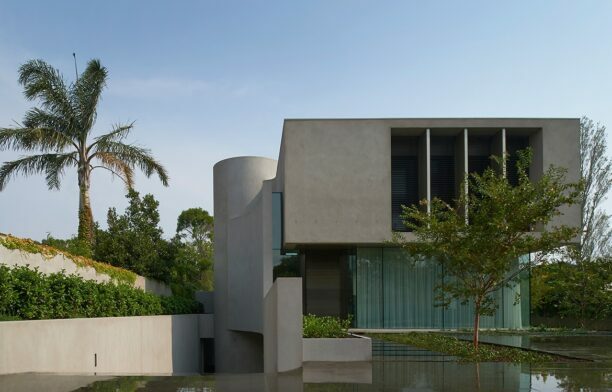 In terms of ‘feeding nutrients’ to the family à la the Halo, the house is littered with design systems that enhance the lives of the residents. 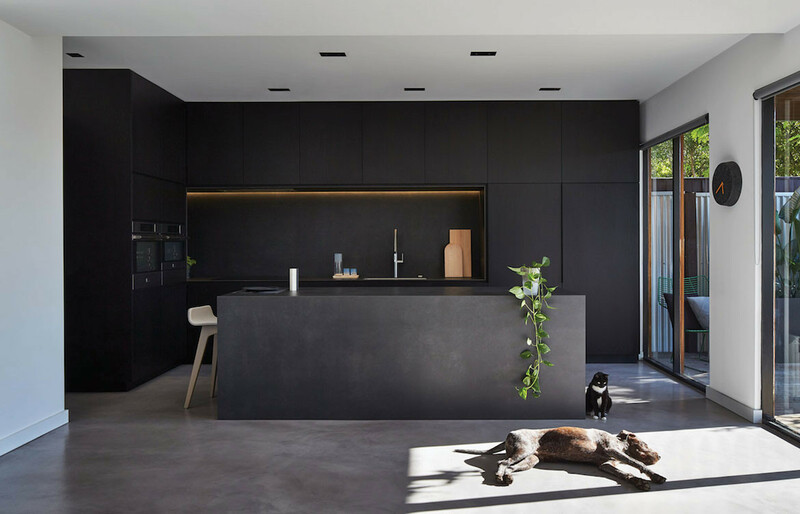 On the ground floor for example, is an entry hall with an individual locker for each family member, an open-plan living/dining space that looks out to the northern garden through timber-battened shutters, and an almost-commercial-sized kitchen. On the southern side of the house, tucked in behind the double garage, is a fully fitted-out gym for the family’s personal training business. The gym can be accessed from a separate entry down the side of the dwelling and shares a powder room with the residence. “A large stairway climbs up through the central void, with a woven-wire-mesh balustrade providing visual and acoustic connection between the levels. Operable clerestory windows bring in natural light, creating the impression of a halo above the stairs. 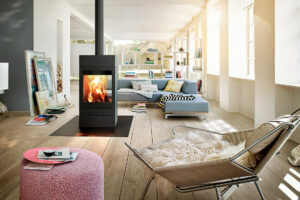 When opened, they create a chimney effect for expelling warm air at night,” says Jeremy. The first floor is given over to sleeping quarters, which, considering the number of people to be accommodated, required a clear design rationale for maximum efficiency. With so many places for the kids to play and do homework – the open-plan ground floor, the large backyard and side courtyard, even the gym – their bedrooms didn’t need to be huge. Arranged around the airy, white-and-blonde-timber stairway and with discreet garden outlooks, they feel anything but cramped. The main bedroom is larger, of course, and enjoys a view down the street thanks to that concealed front window, while the main bathroom also provides views over rooftops and street trees, through a panoramic window. One final flight of stairs leads up to a loft storeroom that can double as guest quarters for extended family. And therein lies the crux of this project: between the shared downstairs living space, the central public avenue of the stairway and the bedrooms clustered together on the first floor, this is very much a house designed to bring family together, where kids and parents are near each other for companionship and support, and where their private ecosystem is fed and nurtured. 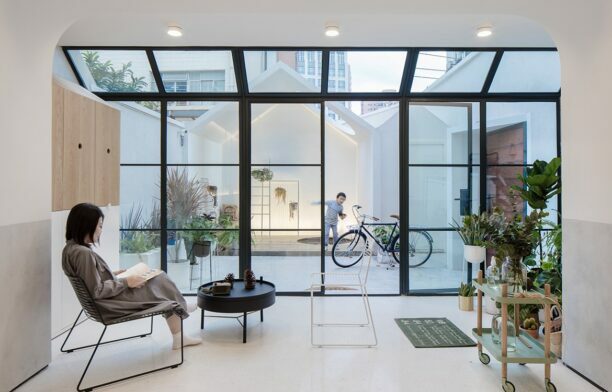 Not a bad template for well-designed living.